Welcome to Fremont Auto Center, the premier Bay Area Mercedes service and repair shop. Naturally, we service and repair Mercedes S-Class vehicles – whether you need Mercedes A service, brake repair, electrical system diagnostics or major engine repairs – we employ nationally ASE certified technicians and use state-of-the-art equipment to service your Mercedes. Our master technicians undergo regular training and are equipped with state-of-the art computerized diagnostic equipment. Supervision is provided by our owner, Sal, who has not only worked for Mercedes dealerships, routinely working on Mercedes S-Class and Maybach vehicles, but is also one of only a handful of technicians certified to work on Mercedes SLR McLaren (there are fewer than 150 such technicians in the entire United States). Regularly servicing your Mercedes S-Class at Fremont Auto Center fulfills service requirements to maintain Mercedes factory warranty. We hope you will entrust your Mercedes to our specialists. Mercedes S-Class has traditionally been the vehicle that was first in the Mercedes line to introduce new safety features, and safe handling of your vehicle is of utmost importance. Not only will highly qualified Mercedes mechanics be working on your vehicle, but if we need to keep it overnight, it will be parked safely inside our building. 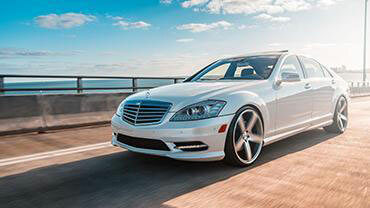 Mercedes S-Class has been a remarkable line, providing trouble free operation to its owners. While 2007 Mercedes S550 did have some transmission issues, and 2003 Mercedes Benz SL500 had suspension problems, in general the S-Class line is remarkably problem-free. At Fremont Auto Center we recommend following Mercedes recommended maintenance schedule – your vehicle will let you know when it’s time for a service. Whether it needs Mercedes A or Mercedes B service, brake repair, A/C repair, electrical system diagnostics, major engine repairs, or maybe transmission service, our master technicians will be able to service your vehicle, often the same day. When you bring your Mercedes S-Class to us, we also perform a complimentary inspection, including inspection of belts and hoses, tire inspection and tire pressure adjustment, electrical system check, and we also check other components that may give us better understanding of the overall health of your vehicle. Fremont Auto Center is a full service Fremont Mercedes repair shop – we provide Mercedes Service A, Mercedes Service B, brake repair, engine diagnostics & repair, brake pad replacement, electrical system diagnostics & repair, cooling system service & repair, computer diagnostics, fuel pump repair, transmission service, A/C service & repair, Mercedes pre-purchase inspections, and “check engine” light diagnostics. So whether your Mercedes S-Class needs routine maintenance, manufacturer recommended service, or may be facing major surgery, bring it to Fremont Auto Center - we will diagnose the problem, and provide you with repair options. For your convenience, you can schedule an appointment online, or simply give us a call.